Weather and road conditions change continuously throughout the year. Sometimes, your tires should change too. Yet tires are one of the most ignored components of your vehicle. If you live in a region that experiences harsh winter weather conditions, you probably need to equip your vehicle with a full set of winter tires to maximize road handling performance and improve safety. To understand why this change is necessary requires a short lesson on the difference between winter tires and all-season tires. 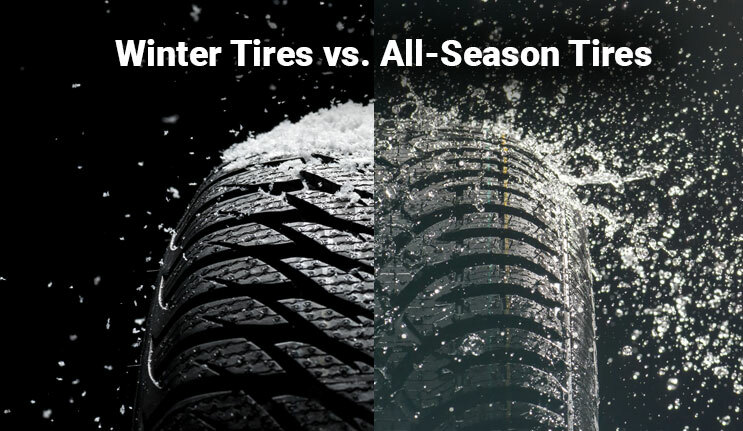 If you think you are always covered with all-season tires, you need to think again. Many brand-new vehicles come factory-equipped with all-season tires, which are fashioned to provide good performance all year long—making them quite popular. These tires adapt to numerous weather conditions like wet roads, light-driving during winter, etc. These tires have been designed to provide good road handling in both the winter and summer seasons. Winter weather can be extreme in many parts of the United States and around the world. Driving in these tough weather climates requires a type of tire made specifically for these environments. The roads during winter are unpredictable with snow, black ice and heavy rainfall. Good tire traction can be difficult to achieve when the weather turns nasty. Winter tires are specially designed to perform safely during bouts of cold temperatures, ice and snow. When designing a high-performing winter tire, manufacturers focus on key areas such as tread rubber, tread patterns, and depth and biting edges. All-season tires are designed for moderate climates, whereas winter and snow tires are designed for regions that experience extreme cold, ice and snow during winter months. Winter tires offer enhanced capabilities like extreme gripping and sharp handling. All-season tires suffer poor traction in snow and ice, while winter tires handle snow- and ice-clad roads with relative ease. In an All-season tire, the tread rubber stiffens and fails to provide sufficient traction. In winter tires, the tread rubber is designed to remain flexible, even in cold conditions, to allow the tire to grip the road more securely. Winter tires have deeper tread depths and unique patterns. While deeper tread depths reduce snow buildup and provide better traction, tread patterns are designed to channel snow and expel water. Winter tires have a high number of biting edges along with numerous tiny slits in the tread which provides better traction on ice. Some winter tires have a multi-cell compound that helps in the removal of the water layer on top of ice, preventing the traction slippage that would occur with all-weather tires. Which tires are the best? The best tire, whether all-season or winter, completely depends on the weather conditions of the place in which you live. If you live in a region that experiences very little snowfall, then all-season tires are the way to go. However, if ice and snow are a common occurrence in your area, then winter tires are a must have. If you do change tires based on the season, always replace the entire set of tires. All-season tires are amazing for the summer climate or areas that have moderate weather conditions, but in colder regions, winter tires take the top prize for better handling and safety.